Napa Valley embraces all its vintners and growers. Paul Segas and Dave Cofran, Highlands Winery’s proprietors, have roots that extend to the Seventies when being a vintner was extremely risky and definitely not a sure thing. The heritage of Paul Segas and Dave Cofran in the Napa Valley extends far beyond their experience, as they are considered pioneers in the Napa Valley viticulture and viniculture community. Combined, Paul and Dave have over 75 years of grape growing and winemaking expertise and every bottle of Highlands wine shines from these experiences. Dave Cofran has worked in the Napa Valley as an enologist and winemaker since 1967. In 1984 he joined an old classmate, Justin Meyer, as General Manager of the famed Silver Oak Cellars. To this day Silver Oak is regarded as one of the premier Napa Valley wineries. Dave remembers the early days of Silver Oak when the winery was literally in an old cow barn. Think back to where you were in 1967 when Dave started in the wine business. His accumulated wine knowledge, experience and judgement can be tasted in every glass of Highlands Winery wines. Paul Segas is another Napa Valley pioneer, arriving during the early Seventies. In 1973 Paul, an executive with IBM in San Francisco, saw an opportunity in the wine business and followed his dream. With absolutely no experience, he acquired vineyard property in both Sonoma and Napa. Paul took classes at UC Davis, networked with vineyard people in Napa and researched Napa Valley extensively while holding down his travel-intensive job at IBM. Paul has over 33 years of grape-growing history in his portfolio. Grapes are picked in small boxes to keep them from being damaged. In just a short time his grapes became a much sought-after commodity for such brands as Chateau Montelena, Bouchaine, Pine Ridge, Robert Mondavi, Joseph Phelps, Domaine Chandon and Mumm Napa Valley, to name just a few. In the course of these relationships, Paul has had the privilege to work with the founders of these great brands, and was amazed that they were willing to share so much knowledge with him. Much of this knowledge would be considered trade secrets in other businesses. In 2000 Paul met the owners of Freemark Abbey, who introduced them to esteemed winemaker Bruce Scotland. In partnership, they created Highlands Winery and successfully established a high-end brand independent of Freemark Abbey. 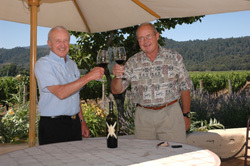 In 2005 Paul purchased the brand and brought on Dave Cofran, who had just retired from Silver Oak, as a managing partner. Just a short time later in mid-2005, a successful business executive from the Silicon Valley, TH Tan, bought into the partnership because he liked what he saw. Being a business person who made his money in his own field of expertise, TH Tan wanted to help finance this propitious enterprise and, at the same time, join forces with the wine-knowledgeable Dave and Paul. TH Tan has actively promoted Highlands wines in Singapore since his retirement in 2006. He was also involved in a promotional tour in Malaysia, his native country, which has bestowed two knighthoods (known as "Dato" in Malaysia) on him for past industrial accomplishments and contributions. In addition, TH Tan has successfully promoted the Highlands brand in the Silicon Valley, notably the Rosewood-managed Cordevalle Golf and Country Club, where Highlands Cabernet won awards in 2012, 2013, 2014 and 2015. Incidentally, CordeValle is the site chosen for the upcoming 2016 Women’s US Open Golf Championship (first Women’s US Open in the Bay Area). 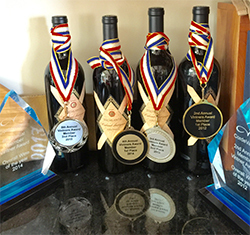 Look for Highlands wines throughout the tournament July 7 to July 10, 2016. 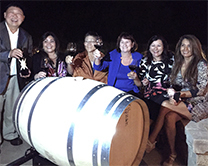 The Highlands partnership has, since inception in 2005, expanded to include people with different backgrounds who all share a love of great wines crafted for maximum pleasure. 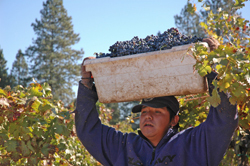 Winemaking is a labor of love and requires resources that can only be provided by successful investors and a knowledgeable winemaker. This partnership has both. The timing is also auspicious as there is a pent-up demand, throughout Asia, for excellent wines crafted with balance and boldness. We in Highlands Winery are looking forward to a very promising and rewarding future.